With the current unpopularity of BJP, such a swing looks very likely. A shift of just 8% voters away from the Bharatiya Janata Party (BJP) and towards its main challenger Congress will mean that Vasundhara Raje and her government will lose the Assembly elections, according to the Election Predictor tool designed by Newsclick (available here). The tool is based on Election Commission data for the past two Assembly elections (2013 and 2008) as well as the 2014 Lok Sabha Elections. In 2013, the BJP got 163 seats in the 200-member Assembly, leaving the Congress far behind at just 21 seats. The vote shares of the two parties were: BJP – 45%; Congress – 33%. Besides these two dominant parties, the BSP had 3.4% votes and three seats, two local parties, the National People’s Party (NPP) and National Unionist Zamindara Party (NUZP) had about 5.3% votes and six seats. Independents and others garnered the remaining 12% votes. While the NPP and NUZP are spent forces now, having split up and swallowed up by others, it is expected that independent candidates and other very small parties may still get a similar vote share in the 2018 Assembly elections, since this is the trend in most Assembly elections. So, the 8% swing away from BJP could very well be supplemented by voters from the NPP or NUZP, too, shifting towards the Congress and boosting the party’s chances even more. An 8% swing translates to about 28.5 lakh voters for the whole state which currently has about 4.75 crore voters. This would work out to about 14,251 voters per constituency on average, although swings will vary with each constituency. Is such an 8% swing possible? 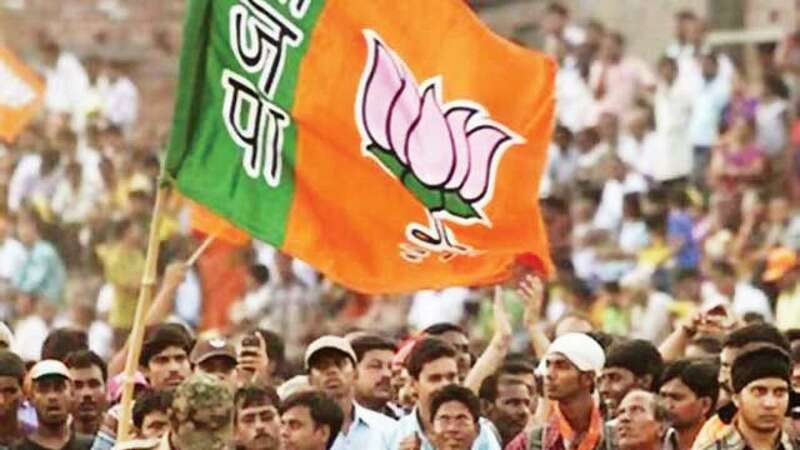 All ground reports till date and pre-poll surveys are indicating that BJP is losing in Rajasthan. A poll of polls (average of various opinion polls) published in the last month shows that Congress is getting about 125 seats while the BJP will have to make do with just 67 seats. This indicates that the projection of an 8% swing away from BJP towards Congress is being felt on the ground. There are other indications too. In the three bypolls held in February this year, a stunning 17% decline in BJP’s vote share was recorded. Panchayat and municipal elections, too, saw Congress gaining at the expense of BJP. But apart from these electoral indicators, the biggest reason to believe that there is a palpable shift of voters away from BJP is the wave of discontent and anger that is sweeping Rajasthan. This is driven by the Raje government’s failure to resolve the farmers’ complaints of very low and unremunerative prices for their produce, raging unemployment in the state, and intensified exploitation of workers with wages stagnant and labour law protections withdrawn. Dalit and tribal communities, too, are up in arms because of continuing neglect and discrimination, cuts in budgetary allocations, and increasing atrocities. The Raje government has singularly failed to protect the rights of minorities in the state, allowing several gruesome incidents of public lynchings to happen. Not just that, BJP leaders and even MLAs have openly sided with lynch mobs with impunity. The push for privatisation and corporatisation of public services, such as education and health, has also angered people because it has meant that these essential needs have gone out of their reach. This all-round disastrous record of the state government must be seen in the context of the Narendra Modi-led central government’s record which has become unpopular because of its own economic policies, including demonetisation and the unjust goods and services tax. This has added to Raje’s woes. What all this means is that the 8% swing projection seems a very clear possibility – and that means the chances of Raje winning this election are getting slimmer and slimmer.